Growing construction market, diversification of economic portfolio, expansion of metros & airports, upcoming new hotels & malls, upcoming Dubai world expo in 2020 are some of the factors that have spurred elevator & escalator market in UAE. The growth in the construction market and rising government expenditure on infrastructure development have also impacted nationwide installation of elevator & escalators across UAE in last few years. However, with declining oil prices in the global market, investments from the government is expected to decline, which may affect the overall growth of the market. Amongst all verticals, commercial vertical market has led the market revenue followed by the residential and industrial vertical market. Commercial vertical is expected to maintain its market leadership through the forecast period. Additionally, Southern region comprising of Abu Dhabi chunked out majority revenue share in 2015. • Historical data of Global Elevator and Escalator Market for the Period 2010-2015. •	Market Size & Forecast of Global Elevator and Escalator Market until 2022. •	Historical data of UAE Elevator and Escalator Market Revenue & Volume for the Period 2010-2015. •	Market Size & Forecast of UAE Elevator and Escalator Revenue & Volume Market until 2022. •	Historical data of UAE Elevators Market Revenue & Volume for the Period 2010-2015. 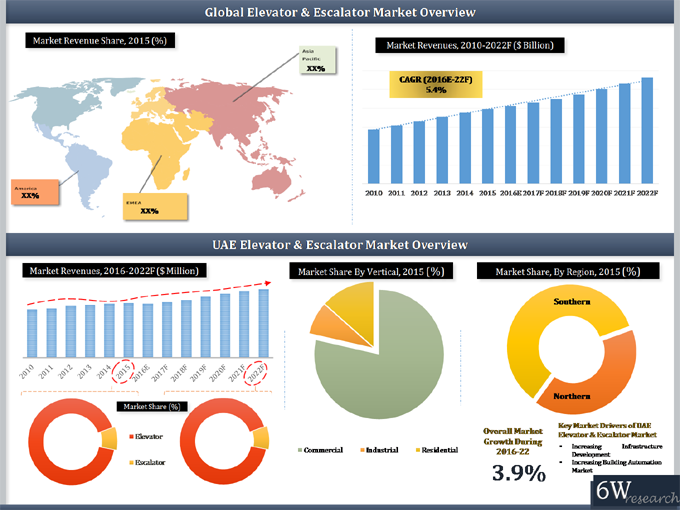 •	Market Size & Forecast of UAE Elevators Market Revenue & Volume until 2022. •	Historical data of UAE Escalators Market Revenue & Volume for the Period 2010-2015. •	Market Size & Forecast of UAE Escalators Market Revenue & Volume until 2022. •	Historical data of UAE Elevator and Escalator Vertical Market Revenue for the Period 2010-2015. •	Market Size & Forecast of UAE Elevator and Escalator Vertical Market Revenue until 2022. •	Historical data of UAE Elevator and Escalator Regional Market Revenue for the Period 2010-2015. •	Market Size & Forecast of UAE Elevator and Escalator Regional Market Revenue until 2022. •	Historical data of UAE Elevator and Escalator Service Market Revenue for the Period 2010-2015. •	Market Size & Forecast of UAE Elevator and Escalator Service Market Revenue until 2022. UAE elevator & escalator market is expected to grow on account of burgeoning construction market, government investments coupled with FDIs investments. New installation segment accounted for highest market revenue share, followed by maintenance and modernization. During 2010-15, the market registered healthy growth attributed to increasing installation of elevator & escalator in high rise buildings. During forecast period, the market for elevator & escalator for new installations is expected to register growth post 2017-18 owing to upcoming Dubai World Expo in 2020, which would result in construction of new hotel chains and shopping malls. The report estimates and forecast overall UAE Elevator & Escalator market by Revenue & Volume and by Type, by Services such as New Installations, Modernization and Maintenance, by Region-Northern and Southern, by Verticals. The report also gives insights price trends, market trends, company profiles, competitive landscape, market drivers and restraints.